How hard has it been for you to leave your new-to-you garden for a year to :- a) discover what is growing there; b) orientation/prevailing wind/where the sun falls when; c) what the soil type is everywhere? I was keen to get going, especially with all those plants in pots that we bought from our old garden to sort out. But apart from the projects I’ve mentioned to you already regarding setting up a vegetable plot, a polytunnel and compost bins in the bottom half of the garden that first winter we were here, we (mainly) left the decorative garden that first year to see what was what. We would have been a lot more hands off except for the visit in the early spring of my step-mother (a Hardy Planter) which galvanised us into activity in two main areas – more of that later. I had a lot of lords and ladies (Arum maculatum) coming up in the grass as well as the beds, and, deep deep joy, cowslips in the grass under the pear trees that ended the rose bed. Cowslips (Primula veris) colonise the grass here happily, and if I lift the turf and relocate it they spread beautifully. Then it is just a case of refereeing to remove thugs like bugle and dandelion from their vicinity. I could see we had a 2m long and high screen of golden variegated privet (Ligustrum ovalifolium ‘Aureum’) hiding the oil tank, and two very tall leylandii about 4m from the back of our garage on the right hand side as we looked down the garden - when I say tall they were taller than the house. There was also the Lonicera nitida hedge across the garden dividing off the vegetable garden and orchard from the top part, and to its right a wall/hedge of common ivy (Hedera helix) at the top of which in the summer I discovered two flowers of what I assumed to be of a climbing white rose. Walking back up that boundary towards the house we found just up from this ivy a Fatsia japonica, and two Rhododendron ponticum, all very sickly looking. Then there was a hawthorn tree with a common holly (Ilex aquifolium) to one side and a yew seedling (Taxus baccata) to the other all presumably sown by birds sitting on the fence post there. Level with the pear trees on that right hand side of the garden was a cherry laurel, (Prunus laurocerasus ‘Rotundifolia’), then a weigela which may be ‘Bristol Ruby’, and a single- flowered philadelphus, probably Philadelphus ‘Sybille’, next to the leylandii. 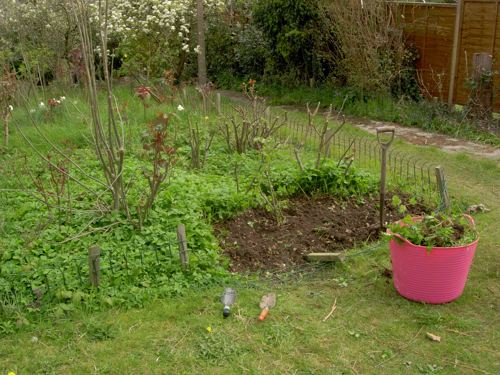 That boundary bed was quite well filled with shrubs. On the other boundary there was a forsythia near the back of the house. Most of the rest of that boundary bed was overgrown with brambles apart from the patch of shasta daisy (Leucanthemum x superbum) half way down that I mentioned in my very first blog post, until you got down to the Lonicera nitida hedge where there was a double white lilac tree, which was reverting to the common purple one (with a bird sown common holly and an elder bush growing behind it against the shed), underplanted with Euphorbia amygdaloides var. robbiae’. To one side was a tall golden rod to the other a patch of red hot pokers (Kniphofia). I am not sure which ones they are but they are herbaceous and flower and are over in early June. What the previous owner did like though, was roses, and it was a delight to see them come out during the year all around the garden, not just in the enormous rose bed. 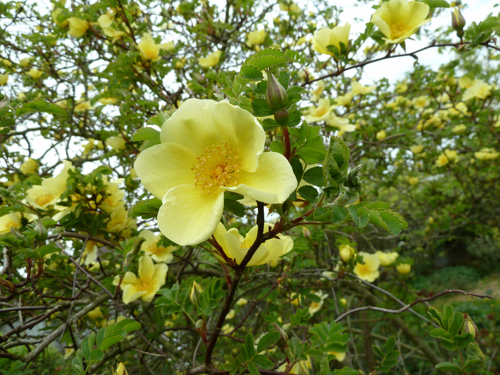 First to come out was a huge Rosa ‘Canary Bird’ which was climbing up into the conference pear tree. In front of it was Rosa 'Fruehlingsanfang' which some years comes out whilst the canary bird is still flowering, and looks like a David Emanuel wedding dress has landed in the garden. I never get pictures that does the totality of its presence (or scent) justice, but here is a mid-shot showing the lovely flowers. As I mentioned in my first blog there is a bed of a beautiful pink rose which may be Isphahan, and then there are lots and lots of one off hybrid tea roses poked at random all over. 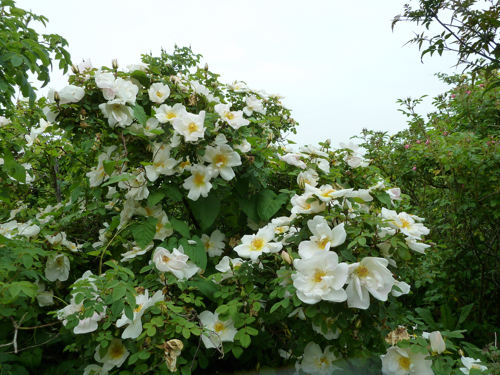 Many were on their last legs and have subsequently been removed, but some are still going strong – including a haendel by the shed, and an iceberg, which pleased me as I had a large iceberg rose in my London front garden and it felt like a bit of continuity. This left me with some big gaps round the roses and I filled them with some of the plants I brought from London. This included a selection of the hardy geraniums – such as Geranium endressii; Geranium × johnsonii 'Johnson's Blue'; Geranium phaeum; a cardoon – Cynara cardunculus; perennial cornflower - Centaurea montana and some Viola odorata. All but the later held their own against the returning ground elder. 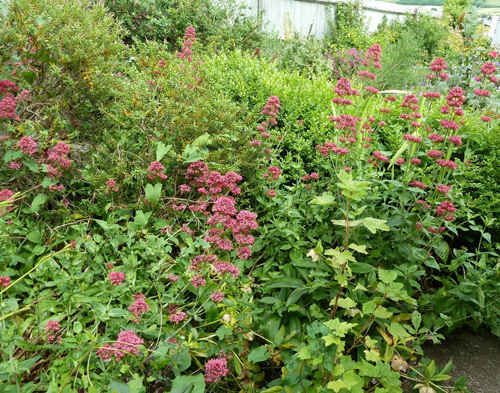 The second thing suggested by my step-Mother was to cut a “hospital bed” from the grass near the Lonicera nitida hedge and to put plants in there closer together than if you were properly planting them, but giving them more root room, protection and moisture than leaving them in their pots all year. 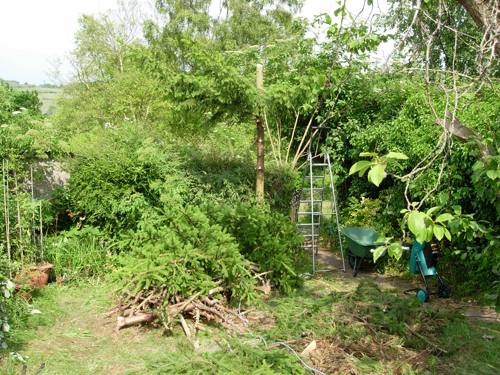 Easier said than done – a bit of tree/shrub clearing had to take place first as you can see. So almost as soon as it was made, the third compost bin became a turf stack. As we lifted the grass we lined the compost bin with it grass to grass and covered it with old carpet and let it rot down into lovely crumbly loam (which it did, albeit over two years.) 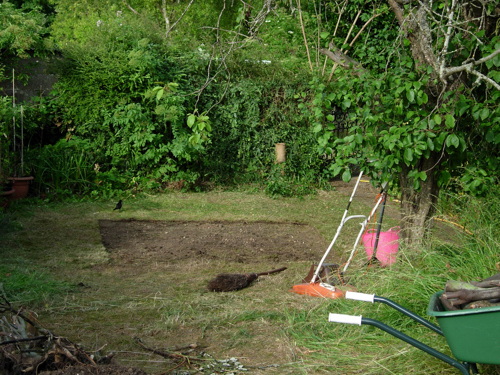 This revealed the thin chalky soil beneath the grass, which we did not enrich all that much as we had no compost of our own to put in, and had used up all the manure we had fetched from a stables in another village in the vegetable garden. We reasoned it hadn’t been cultivated very much so might have more nutrients in it than leaving things in pots, after all, it was only a temporary measure, wasn’t it? Every plant got blood fish and bone in its planting hole, and was put in rows close to its neighbour, most urgent cases first, and then mulched with compost as it was made. Thus the tree peony went in; and the Choisya ternata; Geranium ‘Ann Folkard'; my everlasting sweet pea; prostrate rosemary (which was growing upright at the time, and then prostrated itself all over the golden oregano); Cotinus coggygria ‘Royal Purple’; and a huge number of others. These I remember particularly as the choisya did well, the cotinus died almost immediately, the everlasting sweet pea is still struggling weakly in its third place in the garden, and the tree peony faded away never flowering again. Geranium ‘Ann Folkard’ which is supposed to knit a border together by weaving its way through it (and bought I might add from Carol Klein’s Glebe Cottage Plants at Hampton Court Palace Flower Show one year) looked weak and sickly. Yellowish leaves when compared to other geraniums, and long straggly stems. May be it’s supposed to look like that I comforted myself. Two sorts of honeysuckle brought as rooted cuttings from London did well – Lonicera Periclymenum ‘Graham Thomas’ and Lonicera periclymenum ‘Serotina’, but they had no real supports (temporary bed!!) so twined round other plants, making moving anything, or weeding very difficult. This hospital bed was dug in the spring of 2005, and remained (with many of its original inhabitants) in situ until April 2011. Not so temporary! Next time, what my design plans were, and some first steps. 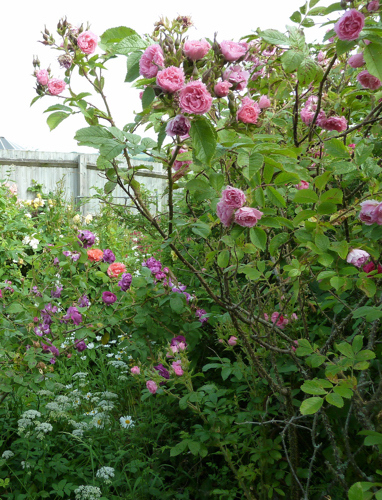 4 Comments To "On a Chalk Hillside May 2017"
Thank you for your comment, I have been too worried for the health of the roses to give roundup a try myself - maybe I need to take a deep breath and give it a go!